In January 2003, the University of Vermont received a generous grant from the Bernard Osher foundation to establish OLLIs (Osher Lifelong Learning Institutes) that provide courses and programs for Vermonters age 50 and over. The University received three subsequent grants followed by a $1 million endowment in October, 2006 to permanently establish the Osher Lifelong Learning Institute at UVM. In 2010, the Bernard Osher foundation granted additional funds to the University to establish a new OLLI on the UVM campus. OLLIs now exist in nine Vermont communities in Brattleboro, Newport/Derby/Stanstead, Central Vermont, Lamoille Valley, Rutland, Springfield, St. Johnsbury, St. Albans and on the UVM campus in Burlington. OLLIs offer new and diverse learning opportunities for serving the intellectual needs of Vermont’s older citizens through non-credit courses and programs offered at an affordable cost in communities throughout the state. Local community members, in collaboration with UVM, design the curriculum and enroll in non-credit classes taught primarily by active and retired UVM faculty or other area college faculty and experts. Currently the Osher Foundation is supporting 118 OLLIs on university and college campuses across the U.S. The Foundation has reached its goal of having at least one OLLI in each of the fifty states. The Foundation also supports a National Resource Center which serves as a connecting resource for all the institutes. 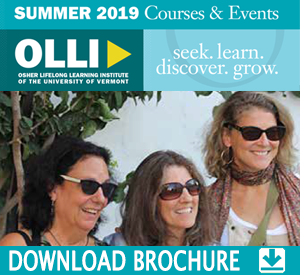 Once you become a member in your local statewide OLLI, you are entitled to attend courses and programs in the UVM OLLIs in the seven other communities throughout Vermont as well as EEE-Burlington (Elder Education Enrichment). Simply present your membership card during the corresponding semester. Your active OLLI membership also entitles you to sign up for OLLI on UVM campus classes at the discounted member rate. Become a member today at your local VT OLLI. Choose the OLLI nearest you and discover what exciting programs await you. Contact information for becoming a member can be found at the bottom of each statewide programs page. Osher Lifelong Learning Institutes are available in several locations around Vermont. Click on the county closest to you on the map below to get more information about the activities and events in that area. Become An OLLI UVM Member Now!